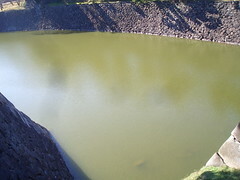 Continuing my museums of Tokyo tour, I decided to venture near the Imperial Palace, at the very center of Tokyo. I visited the Science Museum and MOMAT (The National Museum of Modern Art, Tokyo), and made a short detour into the Imperial Palace Gardens. I ventured into the Palace Gardens with a little apprehension. It’s intimidating to approach it. There’s the busy road, the moat, the stone bridge, the imposing wall, the guards, barriers, and no signs of welcome, and no sign of people entering or exiting. Yet I decided to walk up to the gate house, and when no one stopped me I walked past the guards and finally saw a sign that said I was allowed to enter. There was no entrance fee but I was required to carry a thick plastic guest pass that I had to return upon exiting. Inside were a scattering of foreigners wandering about, an opera house that a former emperor had built for his empress, vast lawns, more imposing stone walls, and gardens. 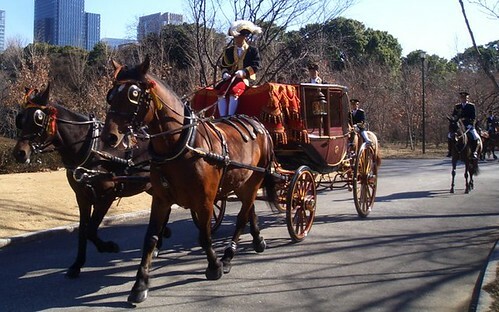 But most surprising were the horse-drawn carriages and cavalry trotting around in Meiji Era uniforms. I think they were exercising the horses. There was a pick-up truck that tailed them in case the horses left behind their business. I’m assuming the carriages were for the royal family if they want to go from one palace to the next, or maybe from their tennis courts to the imperial outhouse. Before being transported in time to the Meiji Era, I stopped by the Science Museum and was transported to other time periods. The highlight of the museum was the Plaza of Bicycles. 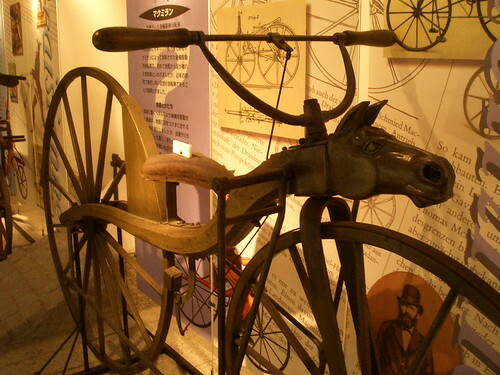 It was a fantastic collection of bicycles from its early forms as wooden riding toys to the sleek whisps of space-age metal and rubber of today. I loved this exhibit. Click on the picture above for more bikes. Just down the street from the Science Museum is the The National Museum of Modern Art, Tokyo, or MOMAT. I didn’t get to check out the permanent exhibit. I only had time to look at the Self/Other special exhibit. This was a brilliantly themed collection, drawing in mostly Japanese artists and some Korean artists as well, to explore how the self is expressed in relation to the other. The museum passed out a collection of essays in English about each of the eight subthemes. Every museum should do this. It starts out slow, with nominally interesting pieces, but ends with some inspired videos. There are three highlights. The first is a photomontage by Tomoko Sawada called “ID400”. It consists of three panels of ID photos taken not in a studio but in the photo ID booth at her local train station. The public bathroom was her changing room. For each of the 400 different IDs she made costume, hair and make-up changes, as well as tweaks in her facial expressions, resulting in identities ranging from vacuous teenager to prim office worker to sullen barfly. 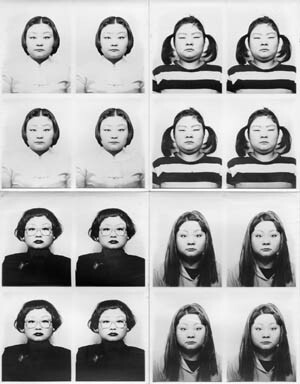 In a medium (a photo booth) meant to capture an official identity, Sawada questions what that identity is, and shows how arbitrarily it can be displayed. “God Bless America” is a time-lapse video filming the artist, Takamine Tadasu, and his assistant, while they eat, watch TV, sleep and copulate. 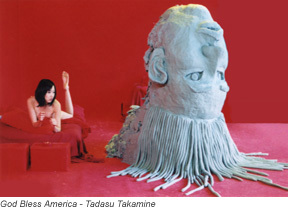 In the center of their red living room is a huge mound of clay that they pound and carve into various creatures and characters, making it sing an old recording of “God Bless America” over and over again. I’m not sure what the political implications of this is, other than that the U.S. is a large presence in the every day life of a couple. Regardless of whatever message Tadasu was trying to convey, it was highly entertaining, mixing claymation and voyeurism to elicit a lot of laughter from the viewers around me. 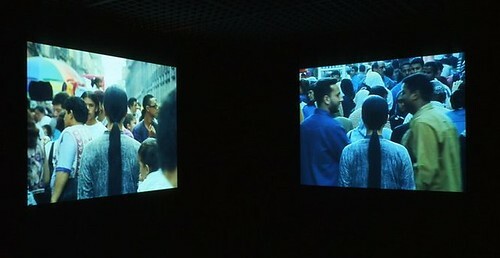 Kimsooja’s “Needle Woman” is an installation of four videos, one on each wall of a black room. She faces away from the camera while people walk past her on busy streets in four cities around the world: Cairo, Mexico City, Lagos, and London. We never get to see the artist’s face. We only get to observe the gaze of the “other” reacting to her. The passers-by of each city had different reactions. On the one extreme were Londoners, who simply ignored her. They briskly walked past without a glance. In Mexico City, the pace was slower and the pedestrians similarly ignored her, but their gaze was downward or away, as if they were trying to not be involved in whatever this woman was doing. In Cairo, she attracted the attention of mostly young men who looked at her directly, talking or laughing, at her or amongst themselves, as they walked by. They were the most aggressive of the four city dwellers. In Lagos, the people also interacted with her but not aggressively. There was a large group of open, smiling children gathered in front of her. Women looked on in curiosity and sometimes stopped to observe her, probably with the same expression that Kimsooja gazed back at them. I was fascinated to see how different cities gazed upon and interacted with someone doing nothing at all. She was, in fact, just standing and looking at them, making herself the faceless other. We can’t close this museum review without a comment on the café. 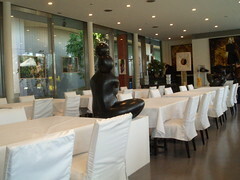 MOMAT’s café, H2, is a posh white affair with a wall of glass facing the Imperial Palace wall and moat. It looked like one of those places where shady art dealers meet. Snobby waiters, 500yen coffee, water served from green bottles, pretentious art photographs suspended on wire hovering above glass bowls of tropical fruit. In short, I loved it. Stop in and make sure not to tip the waiter. Photo credits. All photos not credited to an artist in the text are by Wind.